Clive Wilkinson Gives A Congenially Parochial Report On This Year's Event. A Look At The Latest Aircraft To Enter New Zealand's Ga Scene. Peter Clark Rides Along With Air New Zealand On One Of Their Recent Charter Flights To Japan And Back. Now Disbanded, Peter Cooper Applauds The Premier Royal Air Force ""Tiger"" Unit, No.74 (Reserve) Squadron. Murray E Kirkus Reports Back On The Tiger Moth Club's Fly-In At Bridge Pa.
Bad Guys, Good Guys, Camels And Boomerangs - The Inaugural Classic Fighters Airshow Had It All. 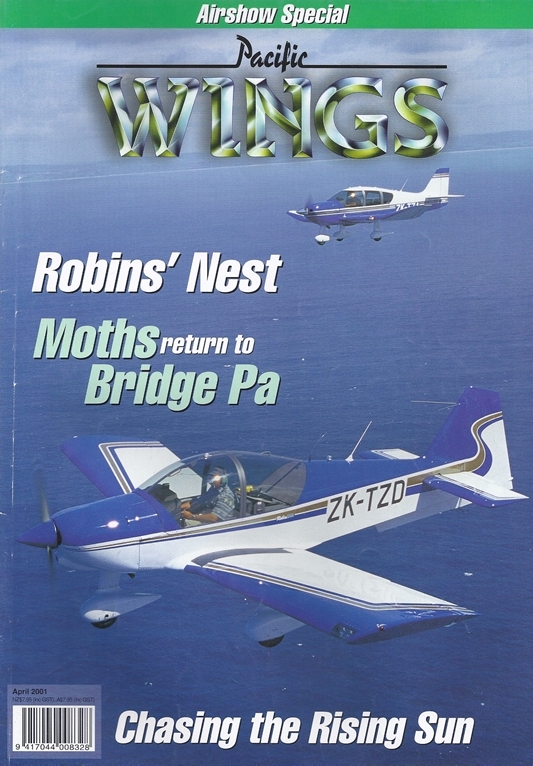 Pacific Wings Takes A Pictorial Look. Report And Photographs By Graeme Mcconnell. As Well As Reporting On Wings Over Lake Taupo, Mike Feeney Has An In-Depth Look At Running An Airshow. Report On The 2001 Meeting On The Igc By Ross Macintyre. Dr Wayne Mapp Comments On The Ca Amendment (No.2) Bill Currently Before Parliament. Mike Feeney Introduces ""Bert"", Our Interpid Private Pilot Who Is About To Learn A Valuable Lesson About Fuel Reserves. Ray Deerness Pays Tribute To Aviation Pioneer Peter Rowley, Tells Of Tigers To Turbines And Troubles At Ayres, While Colin Zuppicich Reports On Super Air's V8 Fletcher.